Sky Blue were on the brink of their first win of the season, until an extra time stunner from Utah Royals FC forward Amy Rodriguez sealed the game at 2-2. Sky Blue scored first on the night thanks to a 14th minute goal from forward Katie Johnson. This was Sky Blue’s second lead ever this year. Johnson then scored her second on the evening to kick off the second half. 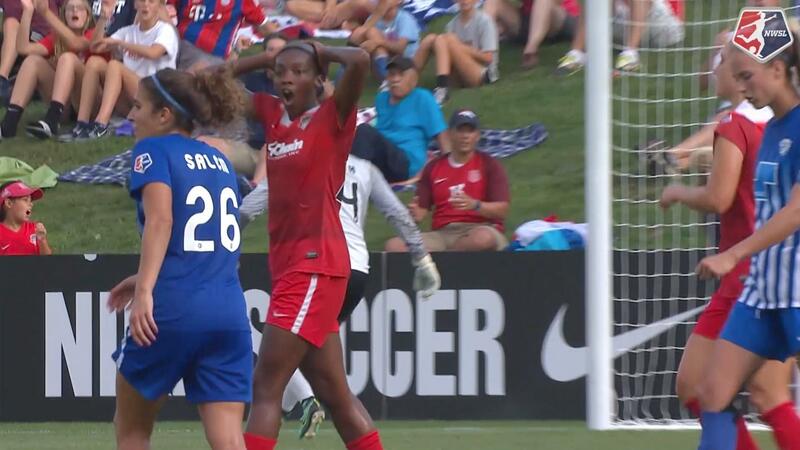 Her brace wasn’t enough as Utah responded forcing an own goal in the 58th minute from Sky Blue defender Dominique Richardson. Rodriguez finished in the 94th minute to earn Utah a point on the road and spoil Sky Blue from their first win of the year. Sky Blue are now 0-14-5 with five points and Utah are 7-7-8 with 29 points. The tie puts Utah in sixth place in the league standings, tied in points with the Houston Dash. Utah has two more games to keep their playoff hopes alive, while Sky Blue is out of playoff contention. 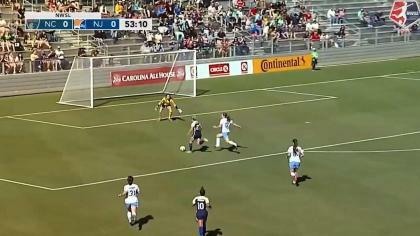 Johnson opened up scoring for Sky Blue after a tough battle in the box between Utah defender Rachel Corsie and Sky Blue forward Carli Lloyd bounced into the path of midfielder Raquel Rodriguez who slipped in Johnson. Johnson slotted the ball home far post past Nicole Barnhart for her third goal of the season. After the half, Johnson scored again for the home team, this time assisting herself with a cheeky chip over a Utah defender. Johnson attempted to play a pass into Imani Dorsey, but the ball deflected back into her own path. Johnson then struck it into the upper 90 to make it 2-0. Johnson finished the game with three shots. Johnson almost had herself a hat trick, but her left footed shot in the 49th minute kissed the crossbar. A lightening weather delay in the match played into the favor of Utah once the match commenced and in the 57th minute an Amy Rodriguez shot bounced off the foot of forward Katie Stengel and then off of Richardson for a Sky Blue FC own goal. Utah continued to press, knowing that a point would be crucial in their hopes to make the playoffs. In extra time, Sky Blue had all their numbers back trying to keep the lead, but chaos in the box ended up in the foot of Rodriguez after Press laid it off. Rodriguez struck it one time to make it 2-2. Rodriguez now has three goals on the year and finished the game with five shots and one key pass. Sky Blue goalkeeper Kailen Sheridan made five saves and Utah goalkeeper Nicole Barnhart made one. Sky Blue will next face Portland Thorns FC on the road on Wednesday and Utah will also travel on Wednesday to face the Washington Spirit. Match ends, Sky Blue 2, Utah Royals 2. Second Half ends, Sky Blue 2, Utah Royals 2. Goal! Sky Blue 2, Utah Royals 2. Amy Rodriguez (Utah Royals) right footed shot from outside the box to the bottom left corner. Assisted by Christen Press. Offside, Sky Blue. Savannah McCaskill tries a through ball, but McKenzie Meehan is caught offside. Foul by Gunnhildur Yrsa Jonsdottir (Utah Royals). Carli Lloyd (Sky Blue) wins a free kick in the attacking half. Offside, Utah Royals. Nicole Barnhart tries a through ball, but Amy Rodriguez is caught offside. Attempt saved. Christen Press (Utah Royals) right footed shot from the centre of the box is saved in the centre of the goal. Attempt blocked. Christen Press (Utah Royals) right footed shot from outside the box is blocked. Assisted by Amy Rodriguez. Attempt missed. Gunnhildur Yrsa Jonsdottir (Utah Royals) header from very close range is just a bit too high. Assisted by Taylor Lytle with a cross following a corner. Corner, Utah Royals. Conceded by Christina Gibbons. Substitution, Sky Blue. Jennifer Hoy replaces Imani Dorsey. Lo'eau LaBonta (Utah Royals) wins a free kick in the defensive half. Foul by Raquel Rodríguez (Sky Blue). Attempt missed. Christen Press (Utah Royals) left footed shot from the right side of the box is high and wide to the left. Assisted by Katie Stengel. Foul by Samantha Johnson (Utah Royals). Savannah McCaskill (Sky Blue) wins a free kick on the right wing. Attempt missed. McKenzie Meehan (Sky Blue) left footed shot from outside the box is close, but misses to the right. Attempt blocked. McKenzie Meehan (Sky Blue) left footed shot from the right side of the box is blocked. Assisted by Sarah Killion. Offside, Utah Royals. Katie Stengel tries a through ball, but Christen Press is caught offside. Becky Sauerbrunn (Utah Royals) wins a free kick in the defensive half. Foul by Savannah McCaskill (Sky Blue). Madison Tiernan (Sky Blue) is shown the yellow card for a bad foul. Katie Stengel (Utah Royals) wins a free kick in the attacking half. Foul by Madison Tiernan (Sky Blue). Attempt missed. Amy Rodriguez (Utah Royals) right footed shot from the centre of the box is close, but misses to the right. Attempt missed. Imani Dorsey (Sky Blue) right footed shot from the centre of the box misses to the right. Attempt saved. Raquel Rodríguez (Sky Blue) right footed shot from outside the box is saved in the centre of the goal. Assisted by McKenzie Meehan. Delay in match Savannah McCaskill (Sky Blue) because of an injury. Attempt missed. Amy Rodriguez (Utah Royals) left footed shot from the centre of the box misses to the left following a set piece situation. Carli Lloyd (Sky Blue) is shown the yellow card for a bad foul. Gunnhildur Yrsa Jonsdottir (Utah Royals) wins a free kick on the right wing. Foul by Carli Lloyd (Sky Blue). Substitution, Utah Royals. Samantha Johnson replaces Rebecca Moros. Amy Rodriguez (Utah Royals) wins a free kick in the defensive half. Foul by Sarah Killion (Sky Blue). Substitution, Sky Blue. McKenzie Meehan replaces Katie Johnson. Attempt missed. Gunnhildur Yrsa Jonsdottir (Utah Royals) right footed shot from outside the box is high and wide to the right. Assisted by Lo'eau LaBonta. Hand ball by Gunnhildur Yrsa Jonsdottir (Utah Royals). Offside, Utah Royals. Christen Press tries a through ball, but Katie Stengel is caught offside. Rachel Corsie (Utah Royals) wins a free kick in the defensive half. Foul by Katie Johnson (Sky Blue). Christen Press (Utah Royals) wins a free kick on the right wing. Attempt missed. Amy Rodriguez (Utah Royals) right footed shot from the centre of the box is close, but misses to the right. Assisted by Katie Stengel. Own Goal by Dominique Richardson, Sky Blue. Sky Blue 2, Utah Royals 1. Attempt blocked. Katie Stengel (Utah Royals) right footed shot from the centre of the box is blocked. Assisted by Taylor Lytle. Substitution, Utah Royals. Taylor Lytle replaces Erika Tymrak. Gunnhildur Yrsa Jonsdottir (Utah Royals) wins a free kick in the defensive half. Delay in match (Utah Royals). Attempt missed. Gunnhildur Yrsa Jonsdottir (Utah Royals) header from the centre of the box is close, but misses to the right. Assisted by Katie Bowen with a cross following a corner. Corner, Utah Royals. Conceded by Kailen Sheridan. Attempt saved. Amy Rodriguez (Utah Royals) right footed shot from the centre of the box is saved in the top centre of the goal. Assisted by Katie Bowen with a cross. Offside, Utah Royals. Rebecca Moros tries a through ball, but Amy Rodriguez is caught offside. Substitution, Utah Royals. Katie Stengel replaces Diana Matheson. Attempt missed. Christen Press (Utah Royals) right footed shot from outside the box is close, but misses to the right. Katie Johnson (Sky Blue) hits the bar with a left footed shot from the centre of the box. Assisted by Savannah McCaskill. Goal! Sky Blue 2, Utah Royals 0. Katie Johnson (Sky Blue) left footed shot from outside the box to the top left corner. Attempt saved. Erika Tymrak (Utah Royals) right footed shot from the centre of the box is saved in the centre of the goal. Assisted by Gunnhildur Yrsa Jonsdottir. Second Half begins Sky Blue 1, Utah Royals 0. First Half ends, Sky Blue 1, Utah Royals 0. Foul by Lo'eau LaBonta (Utah Royals). Carli Lloyd (Sky Blue) wins a free kick in the defensive half. Erika Tymrak (Utah Royals) wins a free kick in the attacking half. Attempt saved. Christen Press (Utah Royals) right footed shot from outside the box is saved in the bottom right corner. Assisted by Gunnhildur Yrsa Jonsdottir. Delay in match Gunnhildur Yrsa Jonsdottir (Utah Royals) because of an injury. Sarah Killion (Sky Blue) is shown the yellow card for a bad foul. Attempt missed. Christen Press (Utah Royals) right footed shot from outside the box misses to the right. Offside, Utah Royals. Rachel Corsie tries a through ball, but Christen Press is caught offside. Corner, Utah Royals. Conceded by Amanda Frisbie. Rebecca Moros (Utah Royals) wins a free kick in the defensive half. Foul by Becky Sauerbrunn (Utah Royals). Katie Johnson (Sky Blue) wins a free kick in the attacking half. Gunnhildur Yrsa Jonsdottir (Utah Royals) wins a free kick in the attacking half. Attempt saved. Christen Press (Utah Royals) right footed shot from outside the box is saved in the bottom right corner. Assisted by Diana Matheson. Attempt missed. 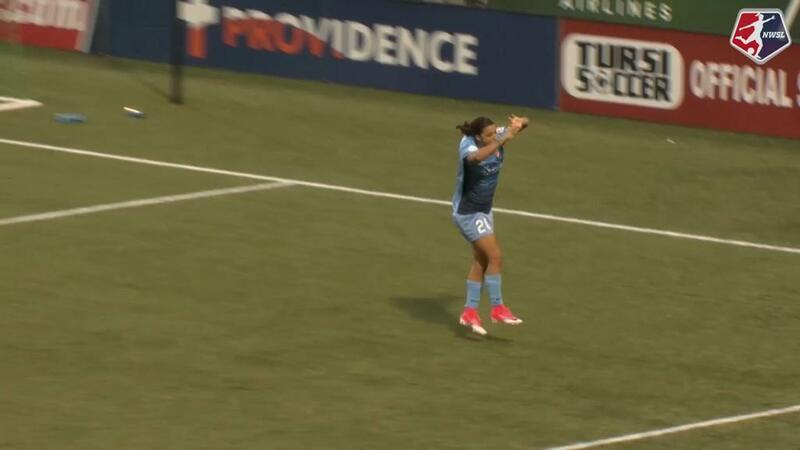 Carli Lloyd (Sky Blue) left footed shot from the centre of the box misses to the right. Assisted by Savannah McCaskill. Foul by Imani Dorsey (Sky Blue). Katie Bowen (Utah Royals) wins a free kick in the defensive half. Attempt missed. Erika Tymrak (Utah Royals) header from the centre of the box is just a bit too high. Assisted by Christen Press with a headed pass. Delay in match Rachel Corsie (Utah Royals) because of an injury. Goal! Sky Blue 1, Utah Royals 0. Katie Johnson (Sky Blue) right footed shot from the centre of the box to the bottom right corner. Assisted by Raquel Rodríguez. Attempt missed. Raquel Rodríguez (Sky Blue) right footed shot from outside the box misses to the right. Foul by Christen Press (Utah Royals). Raquel Rodríguez (Sky Blue) wins a free kick in the defensive half. Offside, Sky Blue. Carli Lloyd tries a through ball, but Katie Johnson is caught offside.